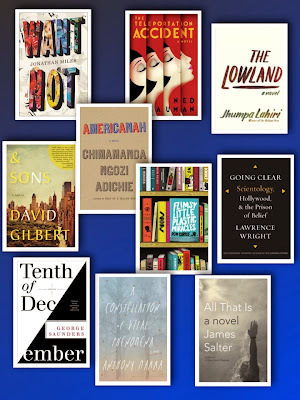 Thank ya - so many good books this year! Really loved several of these (Constellation, Going Clear, Want Not) and I'm really starting to wish I had gotten to Americanah, it keeps popping up on so many lists and sounds wonderful. I've never read any James Salter, so I've already added All That Is to my list. Teleportation Accident has been begging me to read it for a while. Also I've never heard of Flimsy Little Plastic Miracles, but i think I'm going to have to read it. Great list! I'm kind of surprised (and a little sad) Flimsy Little Plastic Miracles didn't find a wider readership - but it's really, really good. Highly recommended! Loved 2 (times a million), 4 and 6! Author Jonathan Miles has a gift for language, plays with language, creates his own words, and displays a riotous sense of humor. Love the best of lists at the end of the year - great for reminding me of books I'd forgotten about or somehow missed how great they are. I have read exactly... zero of these. And they all sound excellent. And now my already-too-long TBR list is EVEN LONGER. Thanks, Greg.